Sir Thomas Lipton creates an immersive experience for the discerning tea drinker. The perfect cup of tea that exceeds expectations starts with the very best tea matched to the occasion, prepared correctly and served with fine attention to detail. From formal business meetings in the conference room to relaxing moments in guest rooms, Sir Thomas Lipton has the perfect tea solution that will leave a lasting impression on your guests, regardless of the occasion. Place one tea bag for each person in a cup or pot. Pour in fresh boiling water. Allow to Infuse for 2 -3 minutes. 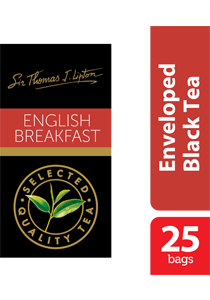 Sealed in high-quality envelopes for fresh taste, aroma and moisture protection this range of specialty tea delivers a superior tea experience.